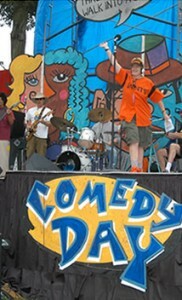 I drove two hours up to San Francisco for this festival billed as “the comedy version of Woodstock! ” Found a parking spot near Sharon Meadow in Golden Gate park as the fog turned to rain then lifted and a crowds of a few hundred, not quite thousands tripping out, sat in the mud and listened, Guess that’s where the similarity to Woodstock ended. It was mainly fat depressed men making a lot of sexist and racist jokes, interlaced with way too many weed/pot stories. If this be the world of stand-up I need to find another niche. I hoped to be inspired for the gig I will do for the ‘Crone Follies’ next week called “AGING POSITIVELY ?” I can do better than that I challenge myself. Stay tuned … I’ll report from Albuquerque.